Black whole peppers: 4-5 Nos. Sliced Fried Onion (Birasto): 1/2 Cup. Chopped Coriander leaves: 1/2 cup. Boil water, when boiling add 4-5 cloves, 1 Bay leaf, 1 cinnamon stick and spoon full of Oil. Once water is fully boiling, Add rice. Add a pinch of salt to it. Cook it for 5 - 10 Minutes. Don't cook the rice fully. Rinse the access water. Keep the cooked rice aside. In a Pan, heat oil. Add bay leaf, cinnamon stick, black pepper and cardamom. Saute them for a while. Add Finely chopped onion and cook it till translucent. Add all the veggies to it. Mix it well. Season it with all spices and again mix gently. Add a cup of curd and half cup of water to it. Mix it well. Add roughly chopped mint and coriander leaves. Cook the veggies with closed lead for 10 -15 minutes. Add water / Curd if required. Take the pan off the flame. Keep it aside for a while with closed lead. Biriyani Gravy is ready. In a pot or deep thick bottom vessel, spread a first layer of biriyani gravy, then a thick layer of cooked rice. Spread fried onion (Birasto), roughly chopped coriander and mint leaves on this layer. Sprinkle a bit of biriyani masala and one full spoon of pure ghee. Again make a layer with gravy and repeat it until you use all the cooked rice & gravy. Close the lead and cover the edges with dough / aluminum foil. Cook the same on a low flame for 10 - 12 minutes. 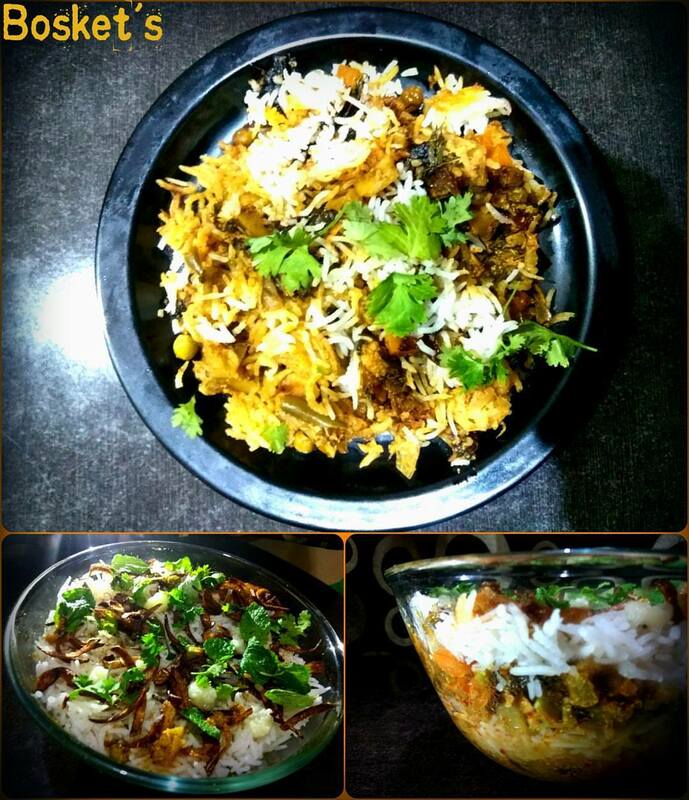 Hot MINTY VEG Biriyani is ready to serve. It can go best with "Mirchi Ka Salan", "Masala Curd" or any of the curd gravy/ curry.